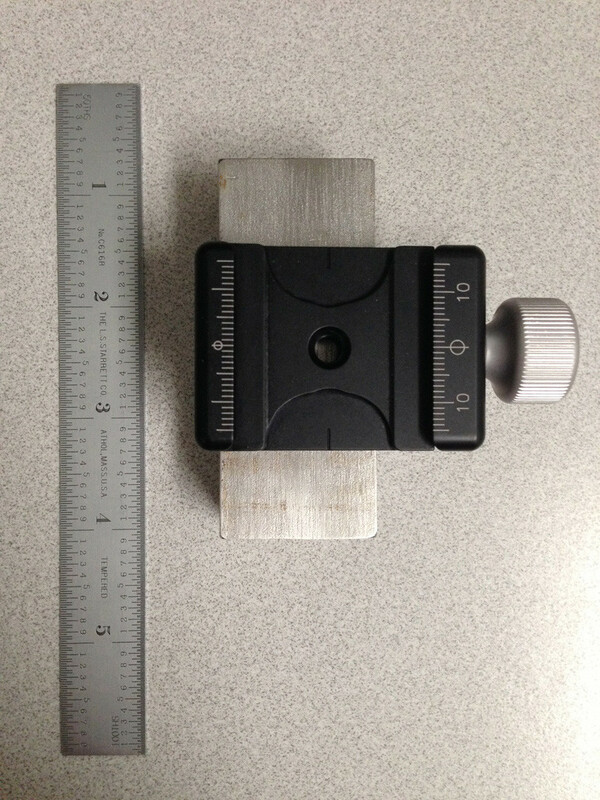 A prototype for testing a 24-ounce deadweight attached to camera via the tripod screw thread. Unfortunately, Sony has a problem with the A7R which is serious for a significant segment of uses, involving longer lenses on a tripod, and especially lenses which are connected via a lens foot or adapter foot to the tripod. The problem also tends to be worse with the camera in vertical position. The first curtain shutter shake is too great to avoid motion blur in many longer-lens situations. This blur can be slight or severe, depending on several variables. A firmware update to provide options to add a delay between the two motions of the first curtain would be a big help, but is unlikely to solve the problem entirely. 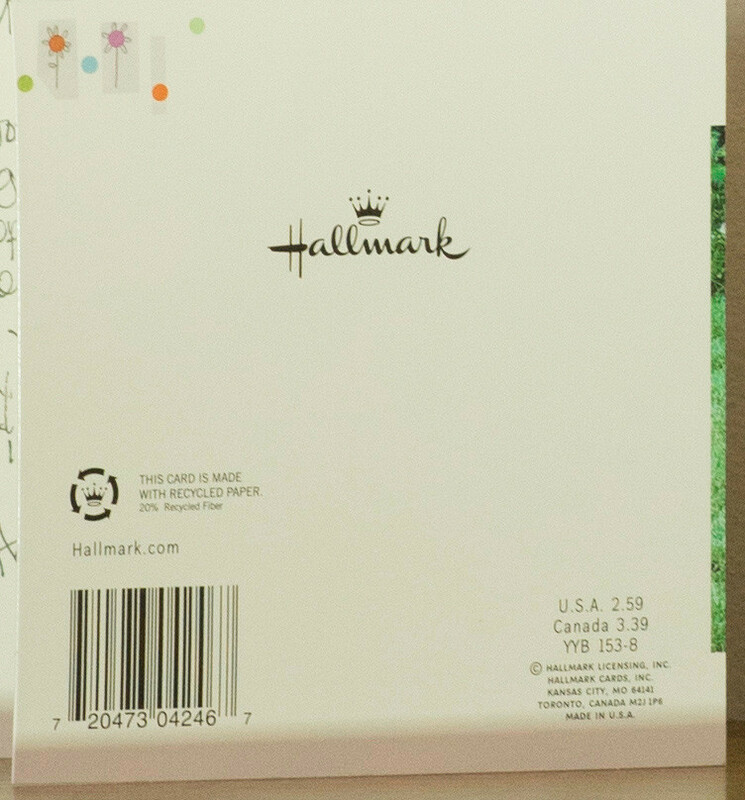 Other remedies, including the use of a deadweight connected to the bottom of the camera, are discussed below. Since this is a live-view camera and it omits electronic first curtain capability, each exposure must start with the shutter first closing then opening, then it must end with the shutter again closing and reopening to restart live view. Traditional DLSRs, when used in mirror-up mode, only need to close then open the shutter, causing less shake, and the very low weight of this tiny powerhouse also makes it more vulnerable to self-induced movement appearing in the image. It therefore would seem to be a very unfortunate thing that electronic first curtain didn’t make it into the A7R, as it did into the A7, and as it did into the Canon 5D II and later. Lloyd Chambers at DigLloyd.com, Michael Schultz and myself, in separate series of carefully done experiments, have found consistent, clear and certain proof of a serious issue with the camera bouncing too much during exposures at various speeds, typically with 1/100th of a second being the worst. The shutter shake seems, if anything, to be a little worse than when the same lens is connected to a Canon 5D II with full mirror slap. The motion is primarily in the direction of the shutter: up and down with a horizontal image and side to side with a vertical image (see samples below), but it also appears to involve a smaller, more general blurring from motion which is side to side as well as in and out. This happens more with longer lenses and more with lenses where the camera itself is not mounted directly to the tripod, rather via a lens foot or the foot of an adapter, so the camera is at the end of a “branch” sticking out in space and unsupported so that it is more readily made to shake. The further the mounting point is from the camera’s sensor plane or the the more readily the camera is moved by its own vibrations, the worse the motion blur is in the capture. And it is also highly dependent on the shutter speed, with longer exposures like 1/4 second and longer being essentially unaffected and the worst blur usually occurring at 1/100th of a second. This shows that the vibrations dampen out more quickly than camera motions with which I have had to deal in older camera systems, be they from mirror slap, shutter shake, wind, tripod touching, etc. Lloyd also observed a sudden up-tick in motion blur at 1/500th with a Leica 280 mm lens, which is a sign of the complex nature of camera system vibrations. I have been seeing the problem at focal lengths between 120 and 160mm (the longest lens I have which will work on the camera at the moment). My friend Mike Schultz has been seeing shake problems at between 100 and 280 mm. Our results and observations are in close agreement overall. So far, the picture with hand-held results is less clear, but we have seen some compelling evidence that the use of a deadweight attached to the camera does improve hand-held results in these longer lens situations where the shutter speed is again one of the least favorable, as one would expect. Also, results we have seen so far with the Metabones Smart III EOS to NEX adapter and Canon IS lenses, like the results of various other photographers whose comments I have seen on the web, suggest that there is a problem with the IS in this system, since hand-held images have looked more blurred with IS on than off. Either the IS cannot respond well to shutter shake because its acceleration is too high (though very brief) or there is a communication problem through the adapter to the camera, or perhaps it’s something else entirely. Surely, as Sony has readied the 24-70 f/4 and the 70-200 f/4 OSS lenses for shipment for use with the A7 and A7R, they will have had to make their OSS system work well, despite the behavior of the A7R’s shutter. Further, Mike and I have shown that attaching a certain amount of weight to the camera can solve the problem almost completely. We are building deadweight setups (some parts shown below) to connect to the base of the camera when using longer lenses when the camera is connected via a lens’s tripod foot or via some lens adapter feet and especially when shooting verticals. I initially tested a 26-ounce weight, screwed to the bottom of the camera for horizontal exposures and found it highly effective with an adapted, light weight, 150 mm lens which otherwise gave shaken images. I also tested 13 ounces and found it to be clearly inadequate, meaning that merely adding the Sony vertical grip will not suffice, though it will help some. Mike tested a 24-ounce bronze weight screwed directly to the base of the camera (pictured above) and it was highly effective for both horizontal and vertical camera positions, when used with the camera connected via a Metabones Nikkor G to NEX adapter to a Nikon 70-200 f/4 VR lens, and the entire assembly connected to his sturdy tripod via a Vello tripod collar and foot with an Arca-Swiss type plate. All of our tests used either the 10-second self timer, the Sony IR remote or the Sony wired remote and no external disturbance of the tripod or camera. 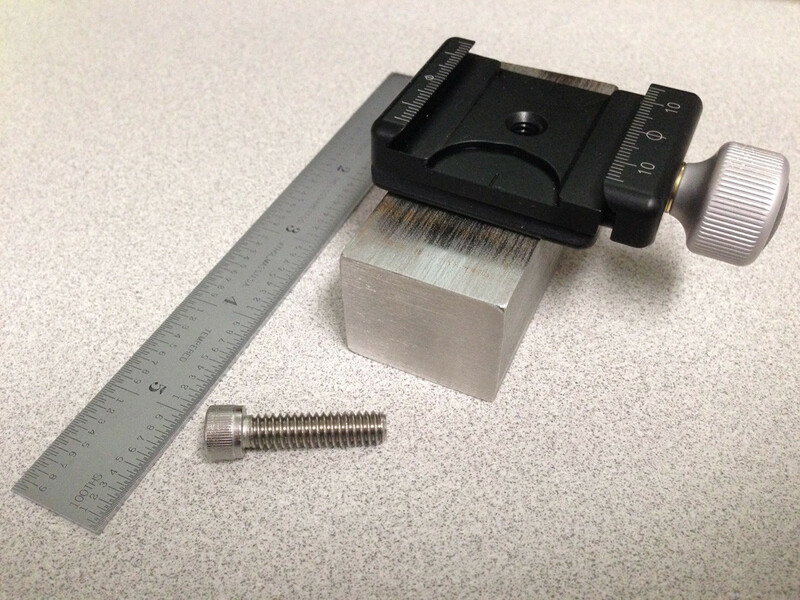 If an L-plate such as the new one from Really Right Stuff, and a compact screw clamp are combined with a block of metal (see below), the metal would need to weigh only about 17 ounces for the total attached weight to be 24 ounces, and can therefore be a piece of brass, bronze or stainless steel about 1″ h. x 1.25″ w. x 3″ long with a hole drilled about 3/16″ behind the middle, because the shutter is about that far ahead of the tripod screw threads of the camera and moving the bar forward a bit will center it right beneath the shutter for optimal effect, assuming the great majority of the movement and shake are coming from vicinity of the shutter blades and not from the portion of the mechanism which sits beside and behind the sensor. A piece of brass or bronze of those dimensions would, depending on the alloy chosen, probably weigh 18 or 19 ounces while stainless weighs 17 ounces in raw form from the metal supplier. We have not tried a series of several different weights, owing to the inconvenience of performing such tests, but a total weight of 24 ounces is apt to be at least close to ideal for the lenses which Mike and I are planning on using with the A7R (up to a 70-200 with a 1.4X teleconverter). What I want is a damping weight which is a good overall compromise for my uses which is easy to use and can be counted on to make the system work beautifully. A different system of camera, adapter(s), lens, lens foot, tripod head, tripod, and working conditions may require a different mass for optimal results. However, I suspect that because more weight could be tough on the lens mount and because less weight didn’t seem to work well for me, that most people who might benefit from a damping weight would find that a total of about 24 ounces attached very firmly to the base of the camera (no cork or rubber padding and good, solid contact with the base of the camera) will work well to cut shake effects in the image by approximately 90%. One report shows that with the camera horizontal, at 1/100th, with a Canon 70-200 f2.8 lens (heavier) set to 200 mm, a Metabones Smart III adapter, and the assembly connected to the tripod via the lens’s tripod foot, that the vertical shake is so slight as to be barely visible upon close inspection. I.e. if you weren’t looking for it, you’d never spot it. By contrast, that same setup with the camera in vertical position would surely give noticeably shaken results, given what we have seen in our tests. On the other hand, if one is able to connect a lens and camera assembly to the tripod via the base of the camera, then the shutter is much less able to move the camera up and down, so a lighter 70-200 like the forthcoming Sony G f/4 OSS may stay seemingly completely unmoved with the camera horizontal, even out to 200 mm and perhaps even more (with a 1.4X in use). I hope. But I’d still expect trouble for the vertical camera position at some focal lengths below 200 mm at the worst shutter speeds. We’ll see. Supporting longer lenses via the camera body, where the camera can handle that weight, may nevertheless open up the system to worse wind-induced vibration than mounting via a lens collar and tripod foot. I recommend that you mount your camera on your tripod, use the live view to zoom in, and disturb the camera with your hands to get a sense of how it moves, both by looking at the magnified image through the lens and by just looking carefully at the camera. I am finding that adapter connections can be either pretty soft in certain directions (such as swing) or quite tight, depending on the adapter’s tolerances and design. One friend’s report on the Sony LA-EA3 adapter is that it has a beautiful and very firm fit to the A7R on the back and a smooth but not as tight fit to his Mirex shift adapter on the front. The camera body and most adapters use three leaf springs to hold the lens’s mounting face in the intended position, but those springs are not very strong, so a lens to camera connection may readily bend if torqued with one’s hands when the flanges of the bayonet are thinner than they might have been. 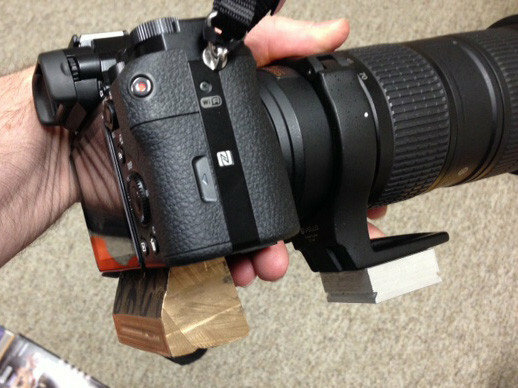 It’s unclear exactly how the shutter’s vibrations might propagate differently through various adapters. Other than the Sony, there are Novoflex adapters for Nikkor F and G to NEX, Leica R to NEX, and Sony A to NEX (among others), but no EOS to NEX. I can’t tell you that the Novoflex adapters will perform better than the many brands of lower-cost adapters, but the sense of those who have used them is that they tend to fit better than most, on average. The smart adapters for EOS to full-frame NEX from Metabones and RJCamera.com may be good choices. We’ve had issues with the Metabones, both from the standpoint of their bayonet flange machining work being defective and their black interior reflectance causing flare from bright sources just outside the image. We are hoping that Metabones will address both of these issues soon. I am looking forward to seeing a new-style adapter from R. J. soon to test it out, perhaps by the first week of January (2014). His has a collar-mounted tripod foot, which I think is a much superior concept to the screwed-on foot of the Metabones, because it allows the camera to rotate to vertical without flopping the tripod head over 90 degrees or using an L-plate on the adapter’s foot. R. J.’s current design also uses a furry black coating in the rectangular throat of the adapter, which is a good approach to preventing obvious flare in the image. I am expecting R. J.’s adapter, like the Metabones Smart III, to accommodate shifting of T/S lenses by up to 12 mm in all four directions without visible vignetting of any degree. Some vignetting for some shift uses is harmless, e.g. when doing a double- or triple-shift stitch, and the inner edge of a shifted vertical frame (or of a risen or fallen horizontal frame) is vignetted either softly or hard, because that portion of that frame will be replaced by image from the on-axis capture during stitching. Sony needs to address this critical issue, which is preventing many uses of the camera from allowing us to get sharp pictures, except by using the dead weight. Notice that of all the samples published on the web during the first six to eight weeks after the camera’s announcement, there have been few, if any, longer lens captures of any kind. No one seemed to be in a position to run longer lens tests with the camera while doing reviews, and so no shutter shake issues were seen. A few tests done by Mike and I with adapted lenses of 85 mm and below at 1/100th of a second, even when the camera is vertical and supporting the assembly by the adapter’s foot, have shown good results, with no more than very slight motion blur, at worst, without the benefit of the deadweight. Native lenses will surely prove to be more resistant to shutter blur when the camera is mounted directly to the tripod, and may also benefit from the absence of an adapter in some cases. No one has seen motion blur at 50 mm or shorter that I am aware of, in the slightest degree. The only case of motion blur being detected at a focal length as short as 55 mm, and also with the lens being natively mounted, that I have learned of was where Lloyd observed a small, general blurring at 1/80th only (not 1/40th or 1/160th), which could not be duplicated with the A7 when using its electronic first curtain (EFC) option. In this case, the lens was so sharp to begin with that degradation could be spotted more easily, and still no uni-directional effect can be readily seen in the images, suggesting that the tripod head’s support of the camera body was sufficient to brace against the greatest motion of the shutter (in the same plane as the shutter and in the same direction as its motion), but that the other, subtler motions of the shutter may not be as much deadened by this resistance. We very much hope that Sony changes the firmware so as to allow two options to introduce a delay between the closing of the first curtain and the opening of the first curtain, to begin the exposure. Such a delay should at least eliminate the additional effect of the first motion of the first curtain, if the delay is as long as perhaps just ¼ of a second, as evidence shows that this vibration is dampened very quickly. The self-timer options in the camera would need to let the first curtain close early, and a Delayed Shutter, non-self-timer option which works like mirror lockup mode would let us use a first press to close the shutter, thus ending live view, then begin the exposure with a second press. Leica did provide a special solution with some such delay with the M240. It is certainly unfortunate that we didn’t get an electronic first curtain option with the A7R, and it remains mysterious why it didn’t happen. Hopefully a follow-on camera will not omit this vital feature for tripod work with a very light weight camera. But in the meantime a modest firmware update could partially solve the problem. I should think it highly unlikely that EFC functionality could be added after the fact with a firmware change, but I can’t say from what little I know of how their system works that this is impossible. We should be so lucky. All of my tripod-shooting photographer friends care about this issue a great deal. The whole point of the 36 MP camera is defeated if its fine detail is ruined by shutter shake. 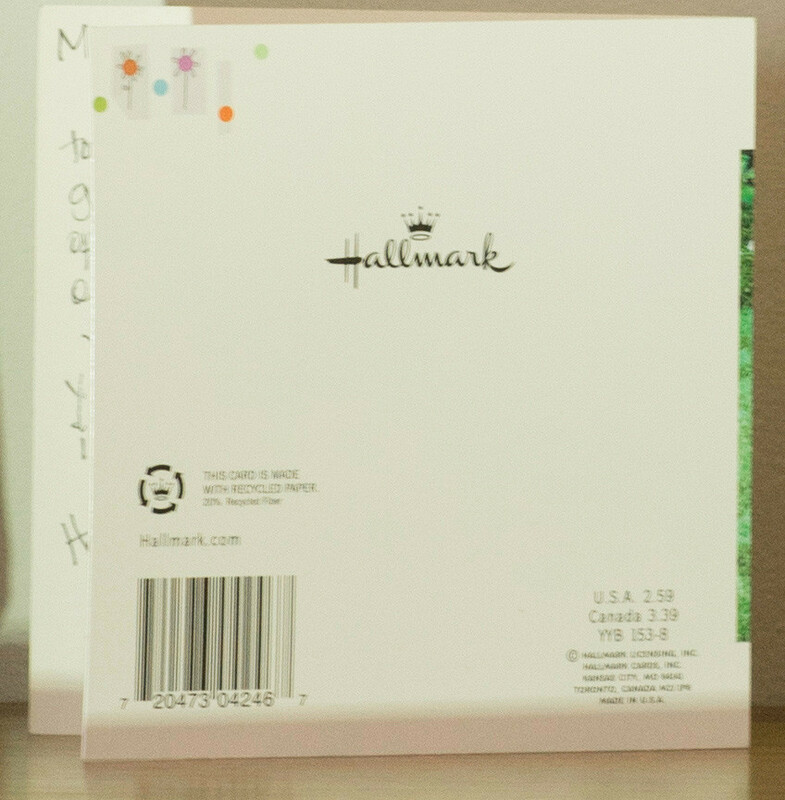 Below are two examples made by Mike (100% sections of a Hallmark card). The first is the Nikkor 70-200 f4 VR lens at 1/100th and 800 ISO at 180 mm, the A7R turned vertical, and the lens connected to the tripod via the lens’ foot. The second is with the 24-ounce brass weight attached directly to the tripod hole of the camera with a ¼-20 screw. The result with the shake is typical of what all three of us are seeing. Shorter lenses are better, longer are worse, horizontal is better and so on. If this camera+lens had been mounted directly to the tripod, the result would probably have been significantly better, but we figure that the weight of the adapted lens would have been too much for the camera to safely support and such a configuration would be very vulnerable to wind when used outdoors anyway. I sure hope Sony responds swiftly and effectively to this issue as I have great hopes for this camera. I’ve been waiting a very long time for a camera that can do what it holds out the prospect of doing (and to a substantial extent, does). Without the dead weight, camera vertical, so shake is left-right. With the weight attached, everything else the same, the shake is greatly reduced. Here are two pictures of my 17-ounce, type 316 stainless block, 1 h. x 1.25 w. x 3″ long, in rough form after some hand cleanup (from OnlineMetals.com), prior to its trip to a local machine shop, plus the clamp which will be used to connect the weight to the camera’s L-plate when added mass is needed to stabilize the A7R. The wide-angle perspective makes the block look longer than 3″. It’s not. The clamp is positioned close to where it will be in the final assembly. The screw’s head will be recessed into the underside of the block and the screw’s threads will engage the threads in the clamp’s ¼-20 hole. There will be a shallow milled groove 1.5″ wide into which the clamp will set, to assure both perfect contact and no twisting of the clamp. The front edge of the clamp will probably bump into the back of a Sony LA-EA3 adapter and possibly also a Metabones or RJCamera.com adapter foot, making them unusable with the deadweight. If the camera is mounted vertically on an R. J. adapter, however, the adapter’s foot will be down and the deadweight will be to the right, so no conflict in that case. I suppose if an LA-EA3 or Metabones Smart III were used with their own L-plate, and the camera were turned vertically, then it might be possible to clamp the deadweight onto the side-piece of the camera’s L-plate and derive some of the benefit of the extra mass (best if it’s in line with the shutter though, i.e. tight against the base of the camera). The deadweight cannot be used when the camera is connected directly to the tripod. I can be used whenever the assembly is connected to the tripod via a lens foot or via a Mirex adapter foot. This means that the deadweight can be used when it is needed most, so this just might all work out. If Sony can reduce the shake, I think that the system will work out well for lenses out to 200 with a 1.4X (= 280 mm), if the deadweight is used when needed. Again, with short lenses, this entire issue is very nearly nonexistent. 17-ounce, type 316 stainless block. Next Post Don’t Shoot ‘Till The Focus Peaks In Their Eyes!